River Ridge junior Skylar White became the third player in program history to reach 1,000 points after scoring a game-high 26 points in Friday's 50–34 win over visiting Shullsburg. 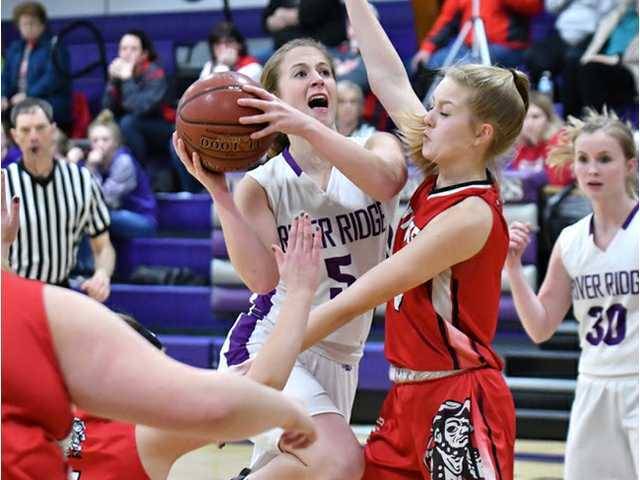 POSTED February 14, 2019 11:45 a.m.
PATCH GROVE – River Ridge junior Skylar White made history last Friday night in a 50-34 Six Rivers West conference victory over visiting Shullsburg. White became only the third girl in River Ridge school history to reach the 1,000-point career mark, and the first to do it in her junior season. Coming into Friday night’s game, White needed 19 points to reach the milestone and join the likes of Bridgett Myers and Stephanie Nemitz. She scored a team-high 26 points, bringing her season average to 20.5 points per contest. With 11 points scored the following Saturday night against Belmont, White now has scored 360 points this season in 18 games. She scored 420 points in 26 games as a sophomore, and 238 points in 23 games as a freshman, giving her 1,018 career points so far, with her entire senior season still ahead of her. White had the hot hand Friday night, knocking down five 3-pointers. Senior Taylor Langmeier chipped in 12 points and 13 rebounds in the win, while McKenzie Graf added eight points. Faith Schier dished out a team-high three assists, while Ruby Breuer had five rebounds. As a team, River Ridge made 18-of-47 (38%) shot attempts, including 7-of-22 (32%) from 3-point range. They were 7-of-15 (47%) from the free throw line, committed 16 turnovers and came away with nine steals. On the following Saturday night, coach Caron Townsend’s Timberwolves cruised past hosts Belmont, 62-19. The Timberwolves held a halftime lead of 24-9, before outscoring the Braves, 38-11, in the second half. Langmeier scored a team-high 17 points, followed by White with 11 and Ruby Breuer and Rylee Zinkle with six each. With the Six Rivers West conference crown already clinched, the River Ridge girls will close out conference play this Friday night against visiting Highland. They will then close out the regular season at Boscobel on Saturday, Feb. 16. As the No. 2 seed in their WIAA division 5 regional bracket, the Timberwolves will open tournament play next Tuesday night against visiting De Soto. The top seed in the regional bracket belongs to Black Hawk.